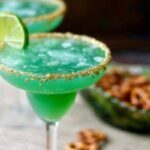 An emerald green margarita with a sweet tropical flavor, this Irish cocktail packs a punch - don't let it fool you! Perfect for St Patrick's Day! Pour the gold sugar crystals out on a plate. Run the rims of the glasses through the sugar crystals to coat. Use a big cookie scoop add a rounded scoop of ice to each of the glasses. Add the tequila, curacao, schnapps, whiskey, Aperol, and juices to a shaker filled with ice. Shake for a few seconds. Pour half into each glass. Garnish with a round of lime.